Felix K asks: Is white chocolate actually chocolate? That depends on who you ask, but on the whole most chocolate connoisseurs would say no. Chocolate is a range of products made with chocolate liquor, cocoa butter, and cocoa solids, among other ingredients. Depending on the proportions of the cocoa, there are several types of chocolate like dark chocolate, milk chocolate, semisweet chocolate, etc. White chocolate is not usually included on this list as it’s missing two of the key ingredients, namely chocolate liquor and cocoa solids, which are the primary flavorful cocoa ingredients in any type of real chocolate. White chocolate in many places does contain cocoa butter which is a type of yellowish-white vegetable fat, but other vegetable oils are often substituted. However, since 2004 in the United States thanks to the Food and Drug Administration, in order for a product to be called “white chocolate”, it has to contain at least 20% cocoa butter. (This was to stop many manufacturers from using only vegetable oil or other fats instead of including cocoa butter). One way you can tell if the white chocolate you’re eating adheres to these guidelines is that high quality white chocolate with cocoa butter has an ivory color. If it is pure white in color, it means instead of cocoa butter, vegetable oil or some other fat was used (though some manufacturers get around the color problem by adding artificial coloring). Among other standard ingredients the Food and Drug Administration has also stipulated white chocolate should contain at least 14% total milk solids, 3.5% milk fat, and no more than 55% sugar or other sweeteners. Finally, there are also lecithin and flavorings (most often vanilla) in the white chocolate as cocoa butter itself isn’t very pleasantly flavorful and thus isn’t typically used as a stand-alone flavor. For this reason, cocoa butter is often deodorized to tone down the strong flavor, to allow the sweeteners to more fully take over as the dominate taste. The American standard was later adopted by the European Union, except the limit on sugar or sweeteners. But, in the end despite the new firm requirement of cocoa butter in America and the European Union, most still don’t consider white chocolate a true chocolate. In order for something to officially be a “chocolate” in many parts of the world, the product must contain chocolate liquor – the thick liquid produced when fermented, dried, and roasted cocoa beans are shelled and then ground. It also should have cocoa solids. White chocolate does not contain either of these things. One of the advantages of the lack of cocoa solids and cocoa liquor in white chocolate is that the quantities of Theobromine and caffeine in it are not usually significant enough to cause allergic reactions in people who are allergic to them. Theobromine, a bitter alkaloid of the cocoa plant, is also what many dogs are allergic to in chocolate. 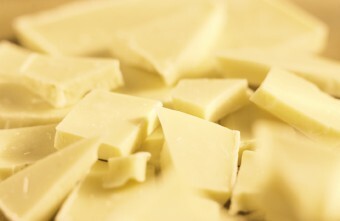 The cocoa butter used to make white chocolate is a very stable fat which has a lifespan of several years without spoiling. It is also used in cosmetic ointments to soften and protect chapped hands and lips and in pharmacies for coating pills. Cocoa butter is the primary ingredient that allows chocolate to remain solid at room temperature and at the same time melt in the mouth, as its melting point is just below the average human body temperature. Cocoa butter is the fat removed from chocolate liquor after it is pressed. Loved learning about this. So many people say white chocolate is a confection and not really chocolate and now I understand what they mean.